There’s something really nice about being able to arrive under your own steam at your airport hotel, fly abroad and then come back to find your car ready for you. 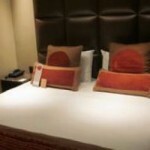 This is the service offered by Radisson Edwardian near Heathrow airport, named Stay, Park and Fly. It beats all the other options in my book – airport parking or paying for a taxi from home, especially when I have an early flight. The best thing about all the rooms is free Wi-Fi, very handy for those of us who want to work in bed in our pyjamas. The beds are all king-size as a minimum, have coffee and tea making facilities, black out curtains and individual room thermostats. There is a spa, open until late during the week and 8pm at weekends with competitively priced treatments and a gym, available for all guests. Two restaurants (one due to be refurbished for 2012) and an attractive bar offer several eating options, none of which I had time to try. A 24-hour room service menu is also available. I arrived frazzled and tired late in the evening and my car was whisked away. After a refreshing shower, I was ready to face the world again. I took a hotel car to the airport in the morning (£12) but could have opted for a Hoppa bus, about half the price, running about three times an hour, journey time about half an hour. On my return, I took a free local bus from the bus station that dropped me right outside the hotel. Within minutes, my car was outside the hotel reception, ready for me to drive home. Popular with seasonal parties and conferences, do try not to have a room with an interconnecting door; and ask to be put in a quiet room away from where the conference attendees are staying. Stay, Park and Fly, with reductions for eating in both restaurants for 4, 8 or 15 days parking start from £108 per room (VAT included) without breakfast. For me, that’s cheaper than a taxi.